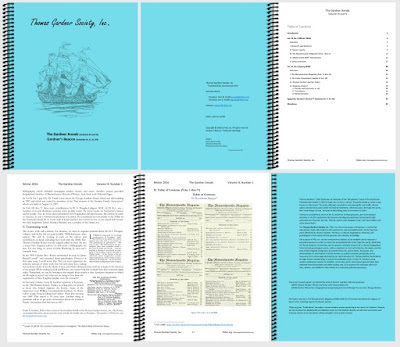 At long last (early discussion, June) and with the summer being over, we have completed the compilation for print of The Gardner Annals, Vols. III and IV, and Gardner's Beacon, Vols. IV, V, VI, and VII. This is a preview look (see Table of Contents, below), from the publisher. We have ordered both color and black/white copies and expect to receive our shipment from the printers within the week. Instructions for ordering can be obtained by notifying us at publications@tgsoc.org. 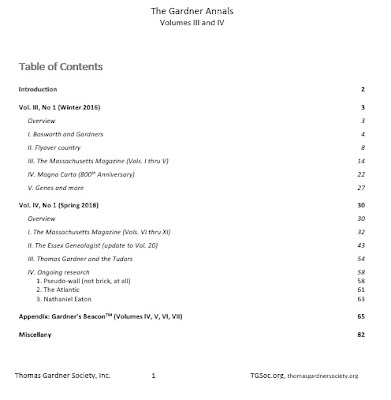 The issue contains all of the Table of Contents for The Massachusetts Magazine. Too, we have articles concerning history and genealogy. As well, future topics are discussed, briefly. 10/14/2018 -- We have the printed copies in house, reading for shipping. We will have our second print (TGA Vol III and IV) soon as preparatory activities are drawing to a close. We recently got notice of an error in one of the early articles (TGA Vol II No 1 - Henry D. Gardiner and the barque Bostonian). Before that, I noticed some minor errors in the first print edition. For example, in TGA Vol I No 1, I typed 1935 rather than 1933 (twice) while referencing Dr. Frank's Gardner Memorial book. Then, I noticed that the footnotes ought to have refreshed across major sections. This is corrected in the second print. But, we had already run into some issues with Gardner's Beacon. In that case, we created Afterthoughts and modifications to handle those. For example, in GB Vol III, No 4, I had used something read on the web without verifying the thing (tsk). The implication that I read was that Damaris' first husband had been discovered. Well, it was not true, and I was too much of a newbie to know the difference. In any case, we later heard from an excited Shattuck descendant wanting to know more. So, I traced my steps which is crucial and found out that the website was gone. Ah. Incidentally, this happens a lot on ancestry (pity those poor folks) and carries even into WikiTree. It's not the bloom off the rose, but it is tiring. How can we make it better? Well, be more careful. And, there are ways to do this. Too, one sees it in Wikipedia, especially when someone writes an erroneous page to begin with. So, this from an entry in What's new (general one for TGS, for now). It points to a post on Nantucket and the wonderful work of Eliza Starbuck Barney. The Nantucket site exults on their being true to Eliza's work. Yes. But, as I have seen all over, no one seems to have a way to present corrections. The proverbial tale is that a correction is in small print on page 15 in a 40 page paper. But, we need to do better; and, the TGS does have an interest in this. So, we will keep with the afterthought approach with Gardner's Beacon. What to do with TheGardner Annals? We'll follow Dr. Frank, hence the title of this post. In his The Massachusetts Magazine, he had a section that was titled, usually, Comment and Criticism. See the TOC of Vol. VII (example from No 4). The sub-heading is "On books and other subjects" which is more broad than handling errata. However, any correction ought to be more than mere overwriting. So, in the case of H.D. Gardiner, we will write an article on this. Turns out that this wife was a Thomas Gardner descendant, too. And, it involves movement from New England. Ah, yes, the western migration. So, there is a page on TGSoc.org dealing with Publications. It will point to this post, however we will be introducing changes to ThomasGardnerSociety.org that will include the facility to meet this requirement. 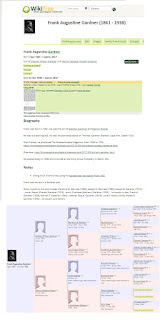 Now that we have Dr. Frank's pedigree in WikiTree, we can use it for articles. This post is timely in that Giles Corey died on the 19th of September in 1692. Three days later, his wife (Martha Corey) was hanged with others. Two of these are ancestors of Dr. Frank (Wikipedia -- Samuel Wardwell and Mary Ayers Parker) -- (WikiTree -- Samuel Wardwell and Mary Ayers Parker) through his grandmother, Lucy Foster (Wilson) Gardner. Now, the title? Giles was pressed for a couple of days before he succumbed. His friend, John Gardner son of Thomas and Margaret, was there. 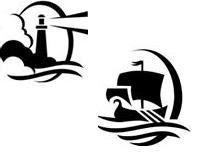 Great Salem Fire of 1914 (4 Jun 2014) -- Started on upper Boston Street and ran down to the shore. Andover ordeal (28 Apr 2014) -- While researching Samuel and Mary, we were following the Wilson line of Lucy. There were two generations that married and doubled down on the witch connections. Samuel's granddaughter lost twelve of fourteen of her children in their childhood. Essex recollections (3 Sep 2013) -- About the extended family and friends of Francis Dane who were impacted by the Salem madness. Meeting, again (10 Feb 2013) -- More background. Imagine a meeting (28 Oct 2012) -- Provides some background and builds a table of participant who were not victims and who are related to Dr. Frank. Gardner's Beacon, Vol. II, No. 5 (27 Oct 2012) -- John Goff, Salem antiquarian, wrote of the Witch House. The theme of this post was a continuation. 1692 theme, again (24 Oct 2012) -- Comments while getting Gardner's Beacon Vol. II, No. 5. ready for release. Salem's madness (19 Nov 2011) -- The English had been mad before. Gardner's Beacon, Vol. I, No. 4 (21 Oct 2011) -- Got into the theme early. First look at how the incident related to the Gardner family. Ruth Gardner (18 Sep 2011) -- Daughter of George Gardner, wife of John Hathorne. The next issue of Gardner's Beacon will go into this subject a little more. Namely, the commercially exploited look at the witches who were not while 150 graves were disturbed from which event we need to know how many were just stone moves with the remains moved without due notice. One thing to do would be to get a list of people, as best we can, who were buried on Gardner Hill. 10/10/2018 -- Added Essex recollections, and others.